The country around our 1846 farm house was a great place for our kids to grow up. They experienced the seasons, learned to handle farm animals and machinery. They attended a three room schoolhouse and later, small schools where the kids knew everyone’s name. 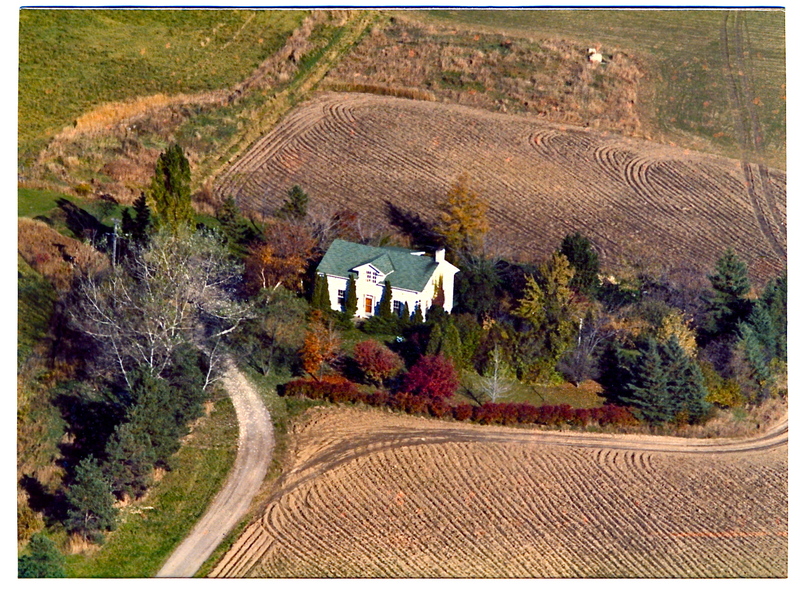 Shown below is our home of 17 years in the midst of 100 acres, 28 miles north of Toronto. By car In 1969, I was on stage and ready to rehearse at downtown Toronto’s Massey Hall in just forty minutes. Today one would be wise to schedule two hours for the same trip. Photo, circa 1980. Click on all photos to enlarge. 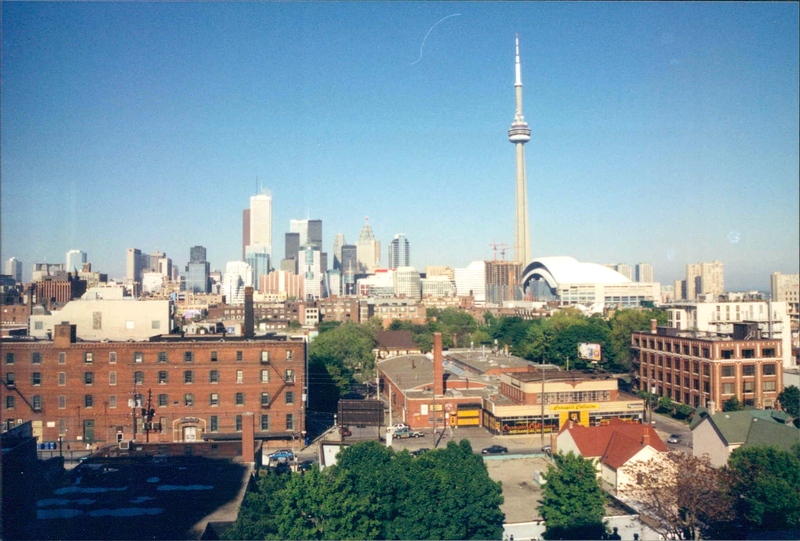 Not long after my wife and I left the farm in 1987,Toronto’s Skyline appeared pretty much as shown in the photo below from our condo windows. The view from our condo is east and south. 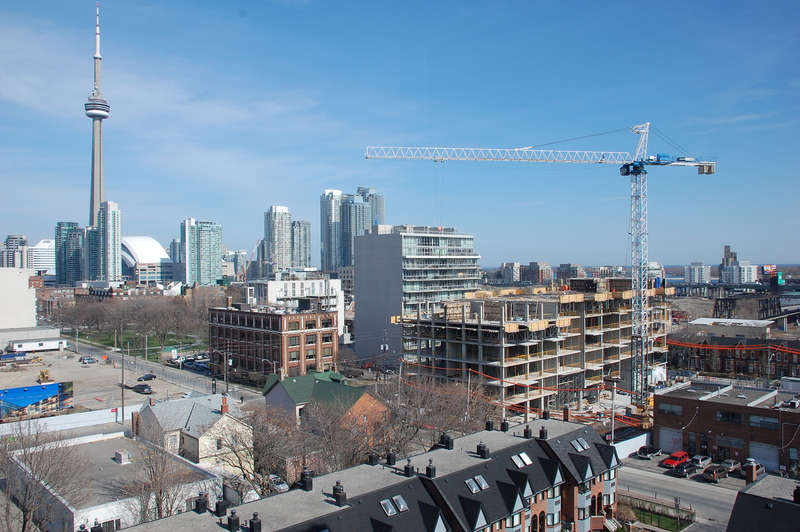 Early in the millinium, condo towers began filling most available empty spaces in Toronto’s downtown core. Shown above is the large auto repair building with its yellow sign. In the photo below, it has been demolished to make room for a Thompson Hotel and condo complex. Beneath the giant crane, a condo building begins to rise across the street. To the extreme right the Bathurst Street bridge, the elevated Gardner Expressway and beyond, patches of blue from the Toronto Harbour, and the tree lined Harbor Islands. On the horizon is the thin blue line of Lake Ontario. On the left is the Rogers Centre, home of baseball’s Blue Jays and the CN Tower begins to disappear from view. Below, the revolving restaurant is all that remainins of our CN Tower view and the baseball stadium is no longer visible. The construction cranes in the distance suggest Lake Ontario and the islands will soon disappear. November 29, 2014. Till Birnam Forest come to Dunsinane. Macbeth Act 5, scene 3. During the last few years, a land rush mentality has swept through downtown Toronto. New condo towers have increased Toronto’s foot print both east and west and dramatically increased its population. Buildings are being thrown up as fast as possible. Some condo towers are completed before cement has settled. Foundations are already showing signs of structural damage due to vibrations from subways, trains and heavy traffic. New condo units with 700 square feet or less, are selling for $550,000.00 and more. Water leaks flow through shoddy brick work damaging new interiors and falling windows have been regular occurrences. There are very few public friendly green spaces. The few postage stamp sized areas with vegetation are only cosmetic touches that attract scraps of paper, styrofoam cups, cigarette butts and dogs. Tenants are mostly young. Anticipating a future with more upscale digs, they show little interest in creating and maintaining a community. A zeal for fast profits has created true concrete jungles. In1968, soon after my family arrived in Canada from the United States, I drove towards downtown Toronto via Bloor Street, a major cross town thoroughfare. I soon had to stop mid-block while two men, headed in opposite directions, casually leaned out their driver side windows for a confab. Evidently they were friends. After a brief visit, they waved goodbye and resumed driving. No one behind them had blown their horn or given any sign of aggravation. Those were the days of Toronto the Good. Traffic has now reached New York City densities and on mid-town streets, tempers have altered dramatically. Our streets are now jamed with pedestrian, bicycle, scooter, bus, streecar, delivery van, skate board, truck and automobile traffic. Drivers accelerate as they approach caution lights. Toronto the Good is becoming Toronto the Surly. Unlike Chicago, no forward looking person with power stepped up to save Lake Ontario’s waterfront for its citizens. Lately there has been talk about civic action, but what’s left to save? A series of towers abutting the Canadian National Railroad lands have masked views of the lake. For most of Toronto’s inhabitants Lake Ontario might well be nonexistant. One can be excused for thinking of money changing hands between developers, mostly foreign, members of the Metropolitan Housing Commission and politicians. A recent Canadian Broadcasting Company documentary quotes realtors and urban planners as predicting many of these new buildings will soon be slums. So, is everything bad? I think not, though one’s decision will ultimately depend upon one’s thoughts about money. Toronto’s all about money whether or not condos are the latest craze. People who live in the midst of this recent growth as do I, can reasonably expect their property values to increase. One sign of an areas prosperity is the amount of pedestrian traffic and we have plenty of that. If you own a business, you can anticipate increased revenues. When we left the farm 28 years ago there were only two or three decent restaurants in all of Toronto. Today we have fine restaurants scattered about the city and a plethora within easy walking distance of our condo. Just north of us on Queen Street West, there are a couple dozen trendy shops that can fulfill the needs of most up-and-coming millenials. The area is awash with creative producers of consumer goods, enough to have warranted a large article in the New York Times. Most of the accoutrements are there. Clothes, food, furniture and luxury items. I believe my wife and I struck gold of our own of sorts when we bought our condo. The complex in which we live has a copious outdoor green space tucked in behind its buildings and town houses. That space holds a large swimming pool, a children’s playground, barbecues, picnic tables and a couple dozen lounge chairs for sun bathing. All this is surrounded by trees, flower gardens and shrubs maintained by unit owners. Indoors we have another swimming pool with hot tub, 2 saunas with dressing rooms for men and women, 3 squash courts, one of which I’m told has a special professional floor, a suite of rooms with a hairdresser, a beautician and a licensed physiotherapist. We also have a comprehensive library with a large children’s sectionn, both with seating areas, all maintained by a retired librarian. There is also a large party room, a theater that shows recent and classic movies, a smaller theater for private family viewing, a room for meditation and yoga and a gymnasium with stair masters, stationary bicycles, treadmills, a rowing machine and weights of all sizes configured to meet one’s needs. Few, if any of these amenities exist in new condo buildings. Our units are hundreds of square feet larger than those presently being stacked up in Toronto’s ubiquitous towers and we are only steps from public transit. Our parking is underground and our reserve fund is healthy. Given the thousands of new condominium units built or abuilding, I believe we’re the best kept housing secret in downtown Toronto. Toronto is a capitalist’s centre of Canada and I am old enough now to mostly enjoy it, no matter how it evolves. However, its seemingly immovable traffic, its gargoyle ugly architecture and brainless urban planning continue to piss me off. Photo: October 2005. Center, our condominium, townhouse complex on King West at Bathurst Street. 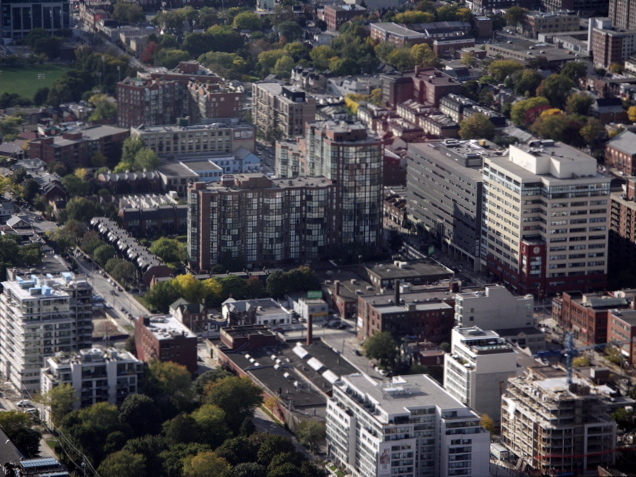 Photo taken from the CN Tower shows the auto repair building, the future site for the Thompson Hotel. The trees in the foreground are in a small park and former graveyard where numerous head stones from the war of 1812 have been preserved.